Usage of green fillers depends on the seasonal changes. Ribbons used in the flower arrangement can be used again. The packing paper used to decorate the bouquet depends on the color available in the market. Cashews available with the gift are of good quality. Roses are the most popular flowers worldwide. Red rose depicts love and care. 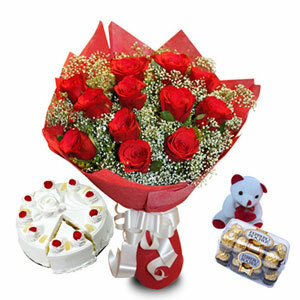 Flowers, sweets and health are something which can be given to anyone on any occasion. This is the perfect gift for all the occasions. 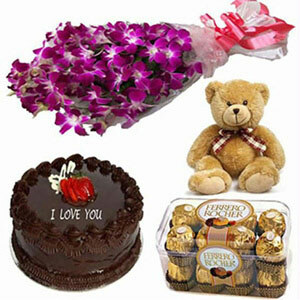 This gift is full of beauty and sweetness and will definitely make your loved ones go crazy for this. The picture of this floral arrangement is exhibitive in nature as everything depends on its availability. The actual gift may slightly differ from the image in terms of its shape or design. We only provide a one-time delivery of perishable items like flowers. Therefore, always provide the correct delivery address while placing your order. Also, ensure that the recipient is available at that address. In cases of temporary or regional unavailability of this product, substitution of this product with other flowers is initiated. The delivery date selected by the customer is just estimation by which they can expect the arrival of their products. A lot depends on the product’s availability and the delivery address provided by the customer. Once you receive your flowers, trim the stems from the bottom and place the flowers in a vase filled with water. Again cut the stems to about 1-2 inches in a slanting direction.Always put the flowers in a clean vase and fresh water. Cut all the leaves immersing in water. Don’t remove the leaves on the stems.Keep a check on the water levels and try to change the water on daily basis for a longer shelf life of flowers. Keep the flowers away from direct sunlight and excessive heat. 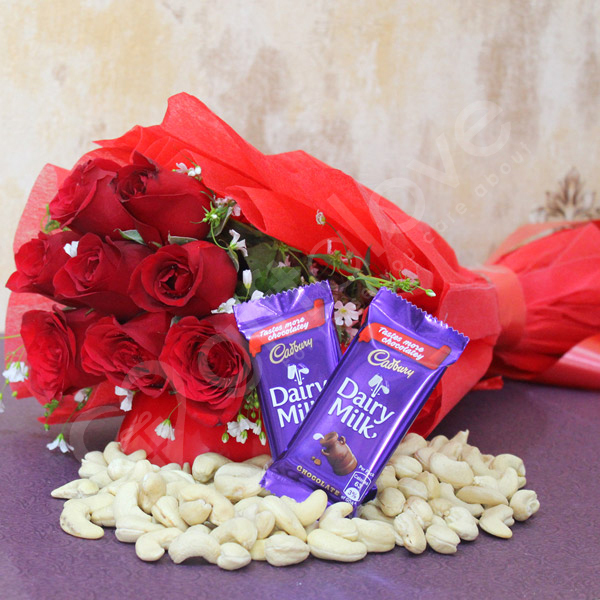 Roses, chocolates, and cashews the combo was really nice because my girlfriend likes all of these. On time delivery was really impressive!